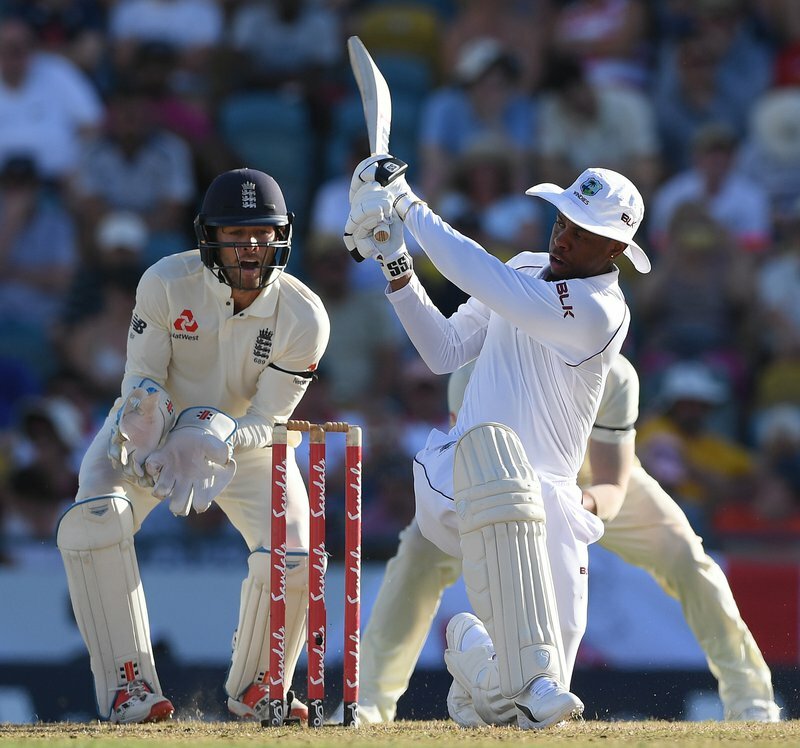 BRIDGETOWN, Barbados – A devastating spell of seam bowling from Kemar Roach sent a shell-shocked England reeling and put WINDIES in command of the first Wisden Trophy Test today here. Roach grabbed 5-17 from 11 overs in a brilliant spell after lunch, as the English were rolled over for 77 about 15 minutes before tea on the second day of the Test at Kensington Oval to hand WINDIES a 212-run, first innings lead. 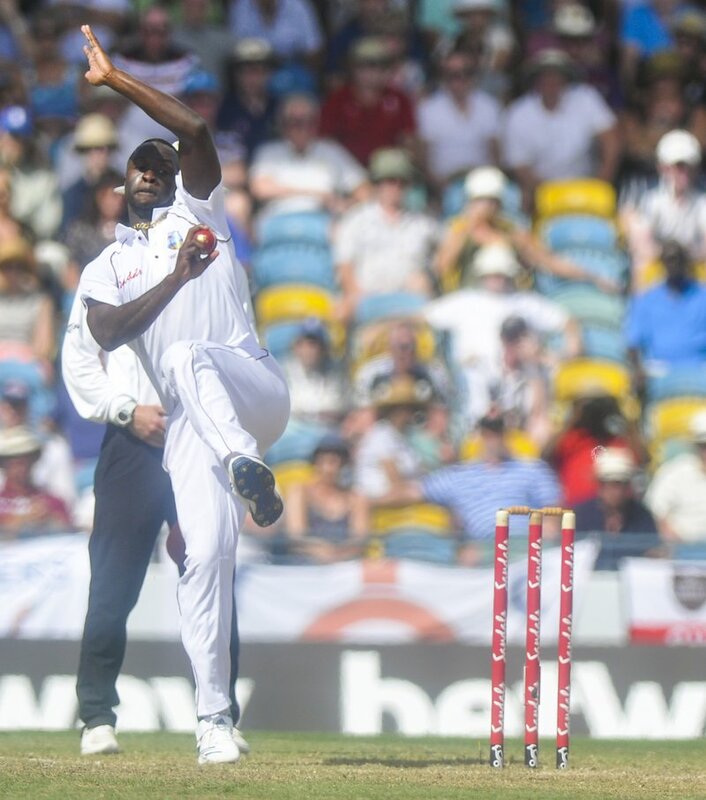 WINDIES captain Jason Holder supported Roach with 2-15 from eight overs and Alzarri Joseph snared 2-20 from 4.2 overs, as the visitors crashed from 30 for one and succumbed for their fourth lowest total against West Indies and the lowest ever total in a Test at the venue. Opting not to enforce the follow on, WINDIES lost precious wickets to end the day on 127 for six, an overall lead of 339 heading into a pivotal third day on Friday. They were well placed at 52 without loss, but lost five quick wickets for nine runs in the space of 28 deliveries before Shimron Hetmyer with 31 and Shane Dowrich, not out on 27, added an invaluable 59 for the sixth-wicket to frustrate England. The left-handed Hetmyer had earlier top-scored with 81, as WINDIES were dismissed for 289 in their first innings, just shy of the hour mark in the first session. Resuming on 56 with the home team on 264 for eight, the 22-year-old was last out after edging a heave at Ben Stokes to be caught behind. He faced 109 balls in just over 2 ½ hours, striking nine fours and two sixes. Hetmyer had earlier extended his ninth-wicket stand with Alzarri Joseph to 25 before the two were separated, 50 minutes into the day’s play, when Joseph edged James Anderson to Jos Buttler at third slip. James Anderson was the most successful bowler for England with 5-46 from 30 overs and Ben Stokes collected 4-59 from 25.3 overs. Faced with just under an hour to navigate before lunch, England lost left-hander Keaton Jennings for 17, nine minutes before the interval, when he sliced Holder to gully. After the interval, there was still no sign of the carnage to come, even when opener Rory Burns played on the fourth ball after lunch from Roach without adding to his two. Roach however, then scythed through the middle order in a period of sheer horror for the visitors, as they lost five wickets for five runs in the space of 45 balls. In his next over, Roach bowled Jonny Bairstow for 12, playing on a delivery that seamed back on the stroke of the hour and England captain Joe Root was lbw to Holder for four. With the score on 48 for four, Roach removed Stokes and Moeen Ali – both without scoring – off successive deliveries. Stokes was forced back and trapped lbw and Moeen top-edged a pull next ball and was brilliantly taken at long-leg by Joseph. Roach got his fifth wicket, when he had Jos Buttler caught behind in his next over, and Joseph claimed two of the last three wickets to fall, while speedster Shannon Gabriel got the other in a second spell, as England folded spectacularly. 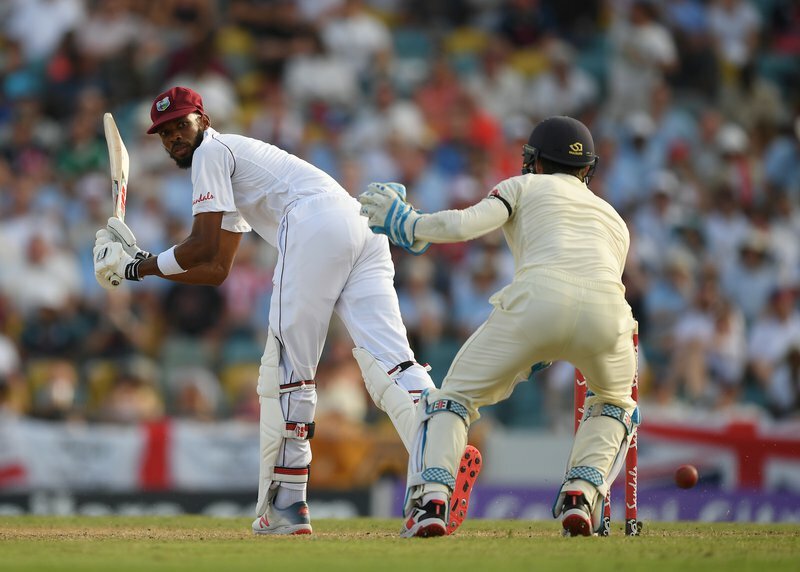 For the second time in the match, Test newcomer John Campbell and hometown boy Kraigg Brathwaite set West Indies on their way with a half-century opening stand, which again kept England without any early success after tea. The left-handed Campbell top-scored with 33 and Brathwaite added 24 before he played back and was lbw to Moeen. Campbell failed to build on a good start, when he toe-ended a slap at a long hop from Stokes and was caught at short cover in the first over after the drinks break to leave WINDIES 60 for two. 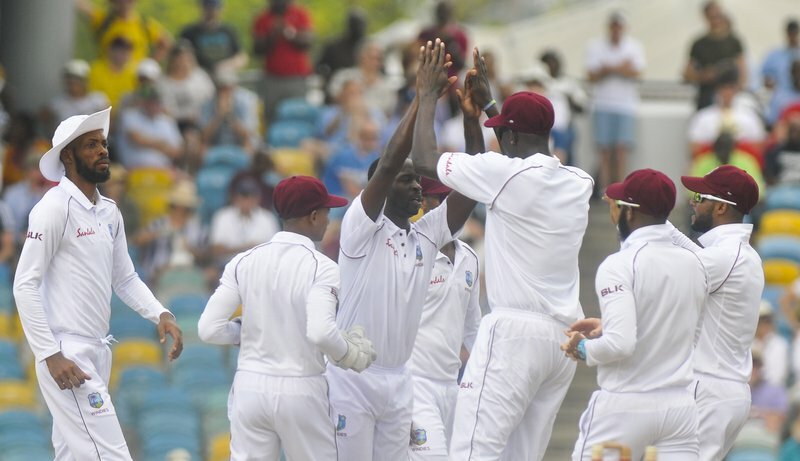 Three wickets fell on the same score to leave WINDIES 61 for five, as Darren Bravo and Roston Chase perished to slip catches off Moeen before Shai Hope was caught at short leg off Stokes for three. As he did in the first innings, Hetmyer came to the the home team’s rescue, hitting a couple of fours and audacious sixes, as he repaired the damage with Dowrich. He fell in the day’s final over however, tapping a gentle drive to Buttler at point off left-arm medium-fast bowler Sam Curran.